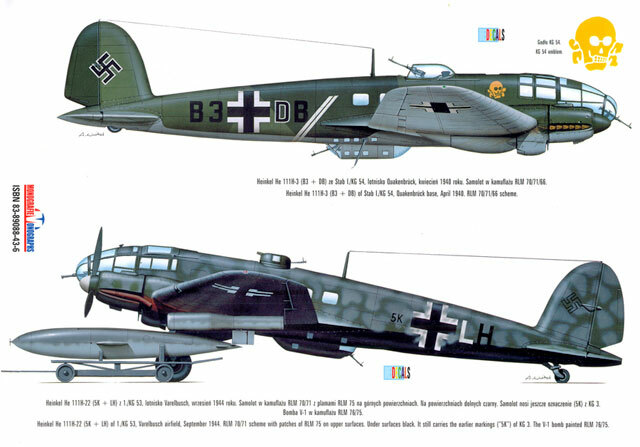 Advantages: Bi-lingual text; decal sheet included for 1/72 and 1/48 scale models; good coverage of He 111 operations including first-person accounts; includes excellent colour profiles and scale drawings. This is the second volume, or part two of covering the Heinkel 111 from the Polish company Kagero. Whilst Volume I follows the typical Kagero format of providing details of development of the He 111 whilst Volume II (this book) provides details of its employment from the days of the Condor Legion in early 1937 to when, through shortage of fuel, it sat on airfields being strafed by P-51s and P-47s of the Eight Air Force during the final days of WWII in 1945. The whole book is comprised of narratives of the hows, whys and where's of the He 111's operational life. The narratives are well written, many of them in the first person by the crew members who participated. For those who have not seen a Kagero book before, the left hand column is printed in the Polish language and the right hand one in English. The captions to the photographs as well as the colour artwork receive a similar approach with the Polish language first followed by the English translation. The book is profusely illustrated throughout with black and white as well as colour photographs. And what excellent photos they are. I'm a bit of a Luftwaffe fan and familiar with the subject but I have not seen a lot of these. 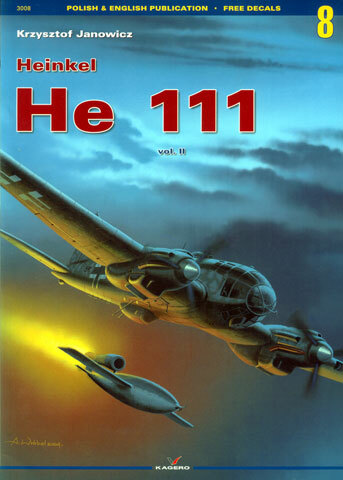 The pics are good quality too and span the life of the He 111. There are also eight superb full colour profile paintings by Zygmunt Szesementa to round the coverage. There are also a whopping 26 sheets of line drawings. The drawings are in both 1/72 and 1/48 scale. One of the drawings is tucked into a little pocket inside the back cover. It is a fold out sheet to A-3 size with drawings on both sides that show plan views of a B-2 on one side and an H-6 on the other. There are also drawings for the Z-1 Zwilling and of the various air-dropped weapons including bombs and the early air-launched missiles (BV 226, F-103, BV 143, and HS 293 to name a few). One sheet of drawings is especially informative. It shows a list of detail modifications of the basic production version so you can identify just what each version looked like. 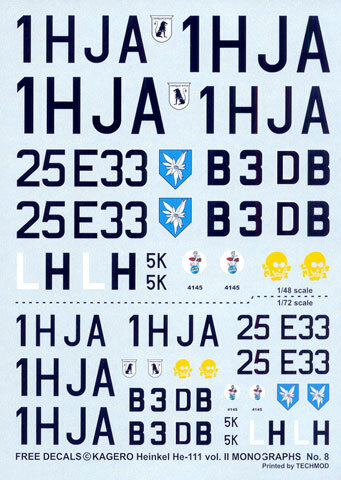 A decal sheet that provides markings for three aircraft is also included with the book. The decals are in both 1/72 and 1/48 scale and are printed by Techmod. The decal sheet is packed into a sealed plastic bag that is placed into a plastic mount on the inside of the front cover. The book is typical of Kagero's Monograph series. It is A4 in size and consists of 80 pages of text printed on glossy paper between cardboard covers.